This is a very soft pillow. I have been searching for months for 1 just like it. I look forward to the 2nd one being delivered. It was exactly what I expected. It was delivered on time. I would recommend it to those looking for that ultra soft pillow. I couldn’t be happier. Ultra-soft and impressively stylish, this gorgeous luxury pillow is stuffed with genuine 600 fill power white goose down. Covered with a silky-smooth 300 thread count cambric cover that makes it feel like you're sleeping on a cloud. 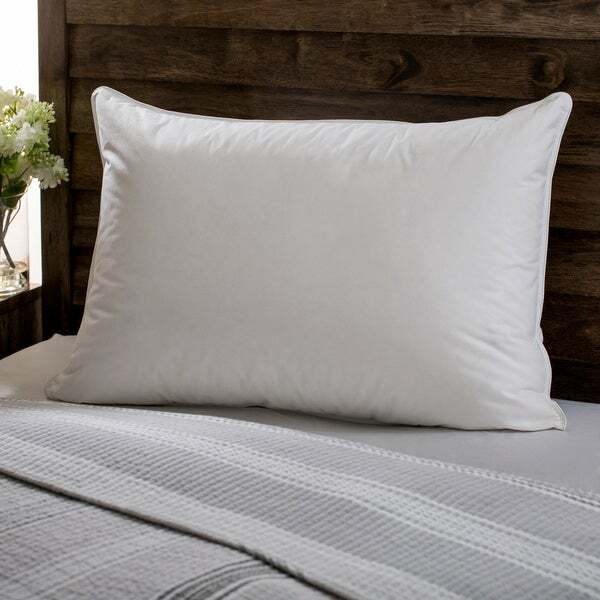 Hypoallergenic and machine washable, this pillow is ideal for stomach sleepers, and features sturdy piped seams that promise easy upkeep and incredible comfort for years to come. I ordered the soft pillow and it is a well sewn pillow with a fair amount of filling in it. I am pleased with my purchase. This pillow is fabulous, I had the best night's sleep last night. I didn't want to get up this morning. I highly recommend this to anyone who has sleep problems, it's just wonderful. So happy I made the investment in myself. I bought this pillow as a gift for my partner, who has has two down pillows that are in desperate need of replacing. We didn't want to spend the money but figured this was a decent price for a luxury item. I bought one, she LOVES it, and then I was jealous so I bought myself one. Two more are on my Christmas list. Santa best be getting them for me. They are super light and fluffy...soft and squishable into any shape your heart desires! Best sleep I've had in a long time! Highly recommend. The pillows are soft and still offer some support which is exactly what I was looking for, but I'm only giving them four stars because they are a bit noisy. When you turn and move around you can hear something crunching. A little weird. LOVE this pillow. Wanted soft and it is that. Sleep like a baby! The best night sleep in a long time! I've struggled to find the right pillows my entire adult life, but i think i found them. My first night sleeping on these pillows, took me by surprise…. it was the first night i'd slept through the night in a long time. I am a back & side sleeper; these pillows offer the perfect amount of softness. No smelly feathers poking me in the night. Perfection. Great quality. They are very firm and have not softened over time. This is a nice down pillow... Down just makes a pillow right...! Blue Goose Down is still the very best in our opinion though...! I was happy with this pillow the minute I received it ! Compares well with pillows at a higher price. So far, very soft and full. This one I gave to my husband to use, he likes to ball and punch pillows into the shape he wants and this is good for that although expensive imo. I like a more medium firm. This was definitely way to soft for me. Exactly what one should expect out of a goose down pillow. Super soft and moldable with a perfect amount of feathers and none sticking out of the fabric. Perfect down pillow, nice quality. Very, very happy with these schmuschy pillows. Purchased as a gift for my daughter, She loves them. Good price too. "Can down pillows be machine washed or do they have to be dry cleaned?" These pillows can be machine washed. "Is the down, duck down?" These pillows are white goose down. "Are these pillows 100% goose down with no feathers?" These pillows are made with 75% white goose down and the remaining 25% are broken fabrics of down clusters, but no feathers. Because I wanted the best of down pillows. "What is country of origin of the down?" This item is manufactured in the USA. "are these pillows returnable ?" This item is returnable in new and unused condition within 30 days of delivery. "I noticed the fill power was listed as 600 for all three European Heritage down pillows. i.e. soft, medium, firm. Please explain. Also, what percentage is the white goose down fill for each." The 600 power fill refers to the size and density of the down feathers used. Usually 600 is a softer pillow about dime size down feather. 700 are medium size and 800 are about the size of a quarter. The 800 is considered luxury. There is no feathers in this product, the law tag will say 75% White Goose Down the remainder 25% are broken fabrics of down clusters, but no feathers. Please let us know if you have any further questions.